We strive to maintain the Interpreting Technology culture of providing uncommon customer service and customized solutions as an integral ingredient to our continued success. We’re all about finding the best IT solutions that fit the exact needs of your business, then applying those solutions to save you headaches and worry. Unlike most other IT companies, we’re not just about keeping your technology functional! We sincerely want to work with you… to show you that your IT can give you exciting new ways to connect with your clients, collaborate with your staff, and streamline the daily work your business needs to do. Our team focuses on delivering you the best end result. We’ll give you a solid foundation of security and preparation, using proactive solutions to catch problems before they start, reducing or even eliminating downtime and disruption for your business. Then, like an IT chef, we’ll blend in the features you need, helping you discover what technology serves you best and ensuring your business will always be ready to compete and grow. That’s our privileged as not just your provider, but your trusted partner in IT. As the company continues to evolve, we shall keep these foundational truths as a solid base from which to build. It is important to realize that, as a whole, Interpreting Technology is made up of an eclectic group of individuals. We strive to maintain an atmosphere that fosters engaged teamwork and a family dynamic amongst the group. As such, our selection process for new team members is fairly involved to ensure that we are not only selecting the right person for the position, but also the right personality to blend with the team. While Interpreting Technology was founded by the dedication of two individuals, the continued success rests on the shoulders of all who become a member of the Interpreting Technology family. Interpreting Technology in Skagit County was formed in early 2010 after the sale of Computer Source NW, the owner’s previous company. The original plan was for Adrian Santangelo to develop an IT training program, but his former clients tracked him down and his devotion to his clients outweighed his desire to develop something new. Initially, Adrian and Pamela worked alone much like when they started their previous company, but as word spread, Adrian found himself too busy to properly meet the technical needs of clients by himself. 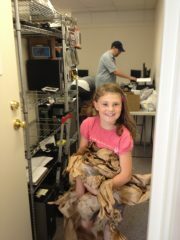 Moving a small office was a lot of work; even the kids were involved. In December of 2013 it was decided to hire a technical team member to work alongside him. At that time the Santangelos were renting a small office from a collaborative business, The Reed Advantage. While this arrangement worked well for a while, it was clear that the small space was not a long term solution for the business. In March 2014 it was decided to actively grow the company and look for a new location for the office to call home. This lead to the remodel of an unoccupied bank which now houses the company. The entire process of the remodel and move was shared with clients through social media. The small team moved the business into their new office on July 26th, 2014. Since the move the companies grow has been controlled, and it is the aim of the company when seeking new team members to hire for long term, not short term needs. This has resulted in a very slow and controlled process as it relates to the addition of new team members. In 2015, the Santangelos and the entire team were honored to receive the distinction of Business of the Year from the Burlington Chamber of Commerce. In 2015 and 2016 it was decided to add several new team members, in the areas of finance, sales, technical, and customer service. The growth as of late has been rapid, but the commitment to customer service and team accountability remains steadfast.